Discover how TopBraid EDG can improve your enterprise’s data governance. What is included in TopBraid EDG? For a full list of capabilities and packages please see TopBraid EDG page and visit our Help Portal for even more information. Can TopBraid EDG packages be combined? Yes. You can combine any packages. You can also add additional packages incrementally. Adding a package does not require a re-install. How can TopBraid EDG enhance search? TopBraid EDG can enhance search strings with related information, such as providing data to convert a search for “Motrin” into a search for “Motrin OR Ibuprofen.” It can provide a search engine interface with data about broader, narrower, and related terms (or custom metadata designed for your enterprise’s needs), and it can also provide automated tagging tools with data to record such relationships to aid future searches. See Search for further information. Does TopBraid EDG support popular vocabulary and metadata management standards? How about more specialized ones? TopBraid EDG-VM has built in support for taxonomies using the W3C SKOS standard for the management of for managing taxonomies and thesauruses. Because SKOS is an RDF ontology, it can easily be extended by incorporating properties from well-known standards such as Dublin Core as well as properties custom-designed for your own needs. For defining ontologies, TopBraid EDG uses W3C SHACL and OWL standards. 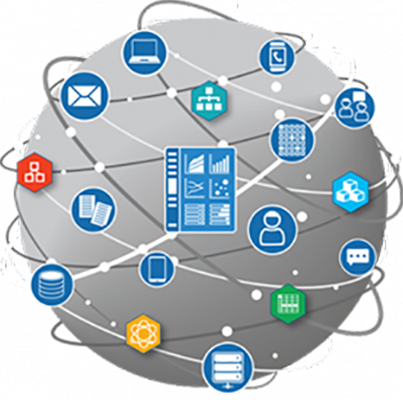 EDG’s metadata management package leverages many pre-built ontologies that describe technical, data and enterprise assets and relationships between them. These ontologies are expressed in SHACL and are configurable and extensible. Does TopBraid EDG manage both taxonomies and ontologies? What's the difference? TopBraid EDG-VM offers a simple interface for managing taxonomies, thesauruses, and other controlled vocabularies, using SKOS and SKOS-XL as the model for that data. Any package of TopBraid EDG lets you create and manage any RDFS, SHACL or OWL ontology model and corresponding instance data that you like. All the specialized features for managing SKOS taxonomies—in particular, the workgroup collaboration features—are also available when you work with ontologies and all other asset collections. Can TopBraid EDG automatically catalog data sources? Yes. TopBraid EDG Metadata Management package can import metadata about data sources using JDBC connector. It can also profile data sources and capture important statistics as technical metadata. In addition to the live connector through JDBC, you can also use DDL and other importers. Can TopBraid EDG automatically connect information? Yes. TopBraid EDG can infer connections between resources it manages using data shapes, rules and other mechanisms. For example, it can auto-build crosswalks between different vocabularies and datasets, it can connected data elements with relevant business terms and it can connect documents to terms. Can I use TopBraid EDG to work with data based on my own ontologies? Yes, if none of the pre-built EDG ontologies address your needs, you don’t have to use them. TopBraid EDG Custom Asset Collection Types module brings in Data Graphs which are designed to contain data based on a model you select at creation. This is similar to Reference Datasets where you chose the model describing dataset’s structure and semantics. Unlike Reference Datasets, Data Graphs are also free of any other assumptions. For example, you do not need to define a property containing a unique key (reference code) for a dataset. With this module you can also create new asset collection types – pre-deciding ontology, editing features and other choices for your users. Does TopBraid EDG support workflows? Yes. TopBraid EDG has a built-in workflow template. Users can define custom workflows and custom governance roles. How does TopBraid EDG support data governance processes and metrics? TopBraid EDG has a number of pre-built governance roles and users can add their own. Users can also define workflows. Asset collections can be organized by the business areas and data domains and roles and workflows scoped at this level. EDG also offers role-based dashboards that display governance metrics that are fully configurable according to the needs of your organization. Further, there is support for tasks and capturing and resolving issues. Can TopBraid EDG capture governance policies? Yes, you can define data governance charter, describe policies and other relevant information. Can TopBraid EDG manage reference data? Yes. TopBraid EDG-RDM is a specialized package for managing, aligning and distributing reference data. Can TopBraid EDG tag my documents for me? TopBraid EDG-VM focuses on multi-user, networked, vocabulary management and it is often combined with TopBraid Tagger & AutoClassifier to automate classification of documents, tagging them with most relevant vocabulary terms. What's the difference between TopBraid EDG and TopBraid Composer? TopBraid Composer is a single-user tool that installs on your Windows, Mac, or Linux computer to make it easier to work with RDFS and OWL models and instance data. The Maestro Edition is a complete integrated development environment that has the ability to quickly develop knowledge graph applications. Maestro includes built-in Jetty server for testing reports and services. It also includes a single user, not networked copy of TopBraid EDG for evaluation purposes. TopBraid EDG is a web-based multi-user product. Like TopBraid Composer it lets you edit models and their associated instance data. Unlike TopBraid Composer it is a data governance solution with many specialized features for working with different types of asset collections, user interface targeted to data governance needs, pre-built imports, exports and reports, role-based access control, workflows and other collaboration tools that let a workgroup coordinate proposed changes and roll them out in a structured fashion. Every change made in EDG is tracked in an audit trail that captures its nature, who made it and when it was made. EDG also includes APIs for communication with other applications. A TopBraid EDG license includes a copy of TopBraid Composer Maestro Edition for use by a system administrator. Is TopBraid EDG available in a SaaS (Software as a Service) model? TopBraid EDG is not currently available as a hosted service, but we are considering this as an option for the future. TopBraid EDG includes installation services to help you host it on your own hardware or on a cloud-based platform such as Amazon Web Services. Many new features can be added by reconfiguring the models used to drive the TopBraid EDG application. This can be done directly in EDG using ontology editor. A number of configuration options are available on various pages and in the Administrative Console. More complex, deeper configurations can be done with TopBraid Composer Maestro Edition, a copy of which is included with TopBraid EDG. This kind of configuration work can be performed by TopQuadrant’s professional services. Further, many TopQuadrant customers have taken the appropriate training in TopBraid application development to learn how to make such customizations themselves. Our TopBraid Wiki Developer guide also guides users through common customizations. Get answers to common questions about the technical integration of TopBraid EDG to your system. What operating systems is TopBraid EDG available for? Because EDG is web-based, it can be used from any popular web browser under any operating system. See Supported Platforms for further details on this and the EDG server platform. How does TopBraid EDG deal with authentication? A typical TopBraid EDG installation uses LDAP to handle authentication. In addition to providing a SPARQL endpoint, TopBraid EDG has many built-in RESTful web services. The TopBraid platform makes it easy to add new specialized ones. Starting with release 6.0, TopBraid EDG supports GraphQL. Does TopBraid EDG offer high availability? Yes, high availability is available when your deployment includes TopBraid EDG Data Platform. How many terms, assets and asset collections can TopBraid EDG store? There are no built-in limits. TopQuadrant can work with you to help plan the right hardware infrastructure to support the scale of data governance that you need. Does TopBraid EDG integrate with the ______ tool? If another tool has a documented API, it can usually work with the TopBraid EDG API to cooperate as part of a Service Oriented Architecture. Does TopBraid EDG include a triple store? Yes, TopBraid EDG includes a pre-bundled triple store (graph database) that will contain all information managed by EDG. This is all done seamlessly. You do not have to purchase or install another triple store. Can I use a third party triple store? All information governed by EDG needs to be stored in EDG’s repository. However, if you have another triple store and you want to have information curated by EDG to be also stored in this database, TopBraid EDG Data Platform can publish data to another system. This is done just-in-time through continuous replication so that data in another store is always up to date with changes in EDG. And, of course, if you prefer, you can also export data periodically. TopBraid EDG offers support for custom workflows, events and job scheduling to facilitate automation of such exports. Learn the ins and outs of TopBraid EDG and get comfortable with the platform. Is TopBraid EDG training available? Many people can get started using EDG once they have worked their way through the tutorial included with the documentation. To provide a more detailed understanding of TopBraid EDG, TopQuadrant provides a four-day course in which the first day covers features available to end users and the second through fourth day cover administrative and customization topics. How I can set up rules and reasoning in TopBraid EDG? EDG performs reasoning (infers new facts) based on rules defined in SHACL, a standard language for defining semantic rules and constraints. SHACL page offers information on creating rules. There are different types of rules – some execute in a batch mode and results are stored and saved. Others execute dynamically at query time and their results are available for display and query but are never actually stored. In the first case, running rules requires triggering their execution – for example, by clicking on an action in the Transform tab. In the second case, rules execute anytime information is presented to a user or a query is submitted. SPIN rules are also supported. Can TopBraid EDG display information in ______ language (e.g., French, Chinese, etc.)? All resources managed by EDG have names (labels). These names can be language tagged to capture names in different national languages. How resource names are displayed to the user is determined by the language preferences in user’s browser. Thus, two users can be looking at the same asset collection (e.g., the same taxonomy) and one would see concepts displayed in English and another would see them displayed in Chinese. The same goes for any textual information about concepts – e.g., definitions, notes, etc. Fields one see on the resource forms (e.g., ‘alternative label’, ‘definition’, ‘note’, etc.) are also resources. If they are given names in different languages, then users will see not only the value of a field in their preferred language, but also the field name as well. How can I get my data into TopBraid EDG? Many users bring data in the tabular spreadsheet format. TopBraid EDG lets you map spreadsheet columns and save the mapping template for future use including automation of imports. There are also other ways to import data – for example, by connecting to a RDBMS (or any JDBC compatible source) or a content management system. Of course, RDF is directly loadable. You can import GraphQL Schemas and JSON data from GraphQL endpoints. You can also bring in XML data and, in general, any importer can be scripted using TopBraid Composer and many pre-built modules for converting data and running transformations. How can I get data out of TopBraid EDG? You can use search to identify information you want to export and immediately download it as a spreadsheet. What columns you want to include is fully configurable. You can save this search and run it again or use it as a web service for other tools. In addition to pre-built RESTFul APIs, new APIs can created. Of course, you can SPARQL to query. And you can also use GraphQL to query. How do I publish an asset collection for use by the broader community of data stakeholders? An optional EDG Explorer add-on functions as a read-only version of EDG. A license for it lets you use it to publish one or more asset collection to as many people as you like for a flat fee. Does TopBraid EDG include a report that shows ______? Can it import or export the _____ format? Out of the box, EDG includes a nice selection of reports, import formats, and export formats. The flexibility of the TopBraid platforms means that EDG can be configured to read new formats and to output new formats and reports with minimal effort.